In this page we first explain the relationship between synthetic biology and artificial evolution-a term we came to define—and where our project stand in this picture; then, we explored the ethical and semiotic dimensions of our project in relation to synthetic biology itself. When exploring the ethical concerns of our project, we realized the true extend and depth of ethics in synthetic biology. So, besides discussing the ethical concern of our project, te Rewirable Circuit, we invented a theoretical model for future iGEMers as a thinking paradigm to analyze synthetic biology ethical problems. It's the first paradigm designed specifically for this field in iGEM history; and despite its imperfections, we sincerely hope it can help future teams open up their thoughts and bring up more innovating ideas. In the semiotics part, we explored the metaphysical meaning of the word iGEM in the context of Runic alphabet, the Elder Futhark, and discovered that by interpreting one letter differently, it translates smoothly into a description of our project, too. By artificial evolution people normally mean something either very simple, as when peasants select the cabbage seeds for next year's crossbreed, a practice long existed before Darwin's age; or something somehow nebulous, involving complex design of circuits, algorithms, and a lot of computing. The former has secured its place in the genetics textbooks and we shall leave it there; the latter still gives us plenty of spaces for fathoming so that's where we'll start. Back in 2012, Masami Hagiya and Ibuki Kawamata did a simplification of Channon's approaches to synthetic biology as described in figure 1 below. 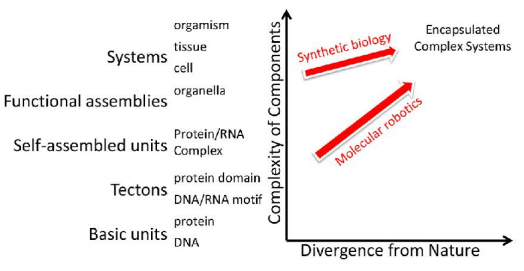 They generalized the ultimate goal of synthetic biology as "encapsulated complex systems", which is the (theoretical) direction our project is looking at from a faraway distance (in practice). 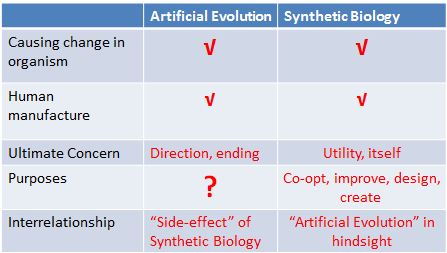 Figure 1: Where is Synthetic Biology Going?---the "ultimate destination".Source: Towards Co-evolution of Information, Life and Artifcial Life. Masami Hagiya and Ibuki Kawamata. Natural Computing and Beyond. Page41. Synthetic biology may or may not have walked half the distance illustrated above, but perhaps it doesn't hurt thinking a little bit ahead, even if that's where we are yet to reach. One would argue that synthetic biology doesn't need to go so far as to reach the "ultimate goal" referred to by Hagiya et al, for mass utilities and applications are already emerging with every tiny step forward. It's true; however, thinking afar also has its advantages, for afar is where more possibilities dwell. After all a synthetic biologist is more than a bricklayer; he has the aspiration of an architect. In another word, synthetic biologists are not ambitious on purpose; however, not on purpose is not enough. Synthetic biology is still exploring its exact definitions, defining it according to our best wishes might not be a completely honest way to face the problems that will arise sooner or later because of its unaddressed implications. We don't think synthetic biology should have the word "artificial evolution" anywhere in its definition, but we do think that it is an implication of what synthetic biology is capable of doing. Evolution as a theory is controversial , but evolution as a word is not. The difference is well told by Stephen C. Meyer, Michael Newton Keas in The Meanings of Evolution , where they describe and unpack the six most common definitions of "evolution” in most biology textbooks. Various definitions make its meaning nebulous, but one brief description should be non-disputable: change through adaptation or mutation. Other debates, such as change of what kind, by what means, wherefrom... are not ours to take on. So the phrase "artificial evolution” that we use here uses evolution as a word simply equivalent to: change, whether through adaptation or genetic mutation. Artificiality "is the state of being the product of intentional human manufacture, rather than occurring naturally, through processes not involving or requiring human activity ." Combining artificial with evolution, we get our own definition of artificial evolution: Causing change, whether through adaptation or genetic mutation, by intentional human manufacture, in organisms. That sounds familiar, isn't it? So, synthetic biology might as well be doing the job of artificial evolution, it's just a different saying with a suffix of "for useful purposes", and with "using standardization" printed in bold. The major difference lies in the purpose: where artificial evolution is to cause change, synthetic biology "looks to co-opt and improve", to "design and create". but synthetic biology might be. synthetic biology is artificial evolution in hindsight. However, if we link synthetic biology with artificial evolution like this, some more questions arise. The question of the "wherefrom" of evolution is well disputed between evolutionists and creationists and is not of our current concern, but the question of "whereto" of artificial evolution has seldom been addressed. Though it seems that we are all content with the bricks we have and can make; after all, a successfully engineered BioBrick is already art, feat, and use enough. Comparing with the present that we are gifted with and that its own possibilities has not been exhausted yet, the future is too far for us to seriously talk about it without sounding self-assuming and ridiculous. However, since we agree with what William Gibson said in The Economist: "The future has already arrived, it's just not evenly distributed yet!" 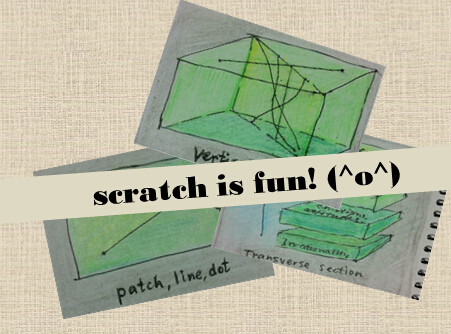 We guess that, if we cannot be comprehensive, then at least try to be original!